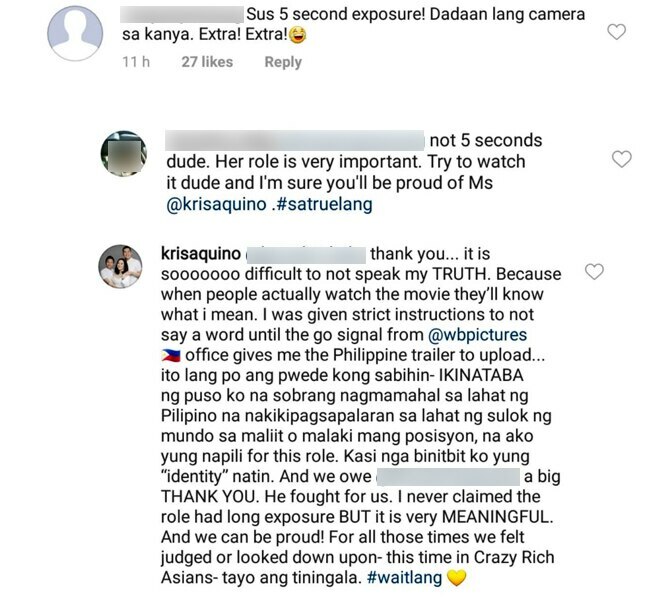 Basahin ang naging sagot ni Kris Aquino sa nasabing basher. Kris Aquino recently announced that she got an invitation to the Hollywood premiere of "Crazy Rich Asians." Though Kris' fans were elated to hear the news, there were some netizens who were not impressed by Kris' inclusion in the international film. In Kris' Instagram post, a basher wrote, "Sus 5 second exposure! Dadaan lang camera sa kanya. Extra! Extra!" 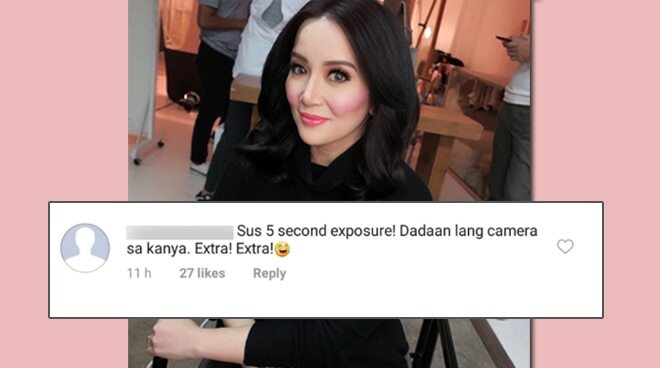 A follower of Kris defended the actress-host and replied to the basher, "Not 5 seconds dude. Her role is very important. Try to watch it dude and I'm sure you'll be proud of Ms @krisaquino. #satruelang." Kris thanked the follower who defended her and explain briefly her role in the upcoming movie. "It is soooo difficult not to speak my TRUTH. Because when people actually watch the movie they'll know what I mean. I was given strict instructions to not say a word until the go signal from @wbpictures [Philippines] office gives me the Philippine trailer to upload," she wrote. She continued, "Ito lang po ang pwede kong sabihin - ikinataba ng puso ko na sobrang nagmamahal sa lahat ng Pilipino na nakikipagsapalaran sa lahat ng sulok ng mundo sa maliit o malaki mang posisyon, na ako 'yung napili for this role. Kasi nga binitbit ko 'yung "identity" natin. And we owe @kevinkwanbooks a big thank you." Kris clarified that she never claimed that her role had a long exposure in the movie. "But it is very meaningful. And we can be proud! For all those times we felt judged or looked down upon - this time in Crazy Rich Asians - tayo ang tiningala. #waitlang."